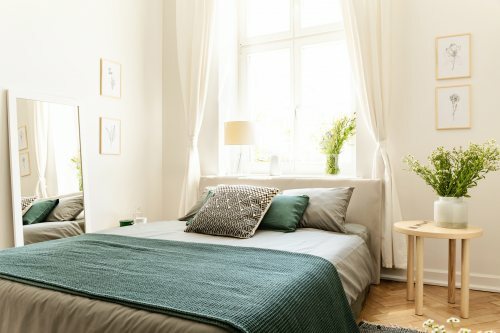 Spring is finally here and as the warmer days commence, it’s about time to rethink your bedroom decor. Wintertime is all about the snuggles, but once the blossoms come out, it’s nature’s cue to get ready for a new season of vitality. One of the simplest ways to change the look and feel of your bedroom is to pick a new accent colour. For spring/summer 2018 consider sage, dusty rose, ink, mandarin or lemon. These are the top fashion colours for the season ahead and works well in terms of interiors as well. Change up your duvet cover, invest in a new throw or swop out your scatter cushions for new additions in a bright new hue and see what a difference it makes. Not keen to spend too much money on your refreshed interior? No problem! One of the simplest ways to update your room is to introduce a few items that you already have in your home. Swop around bedside tables between rooms (perhaps give it a lick of paint, or go metallic? ), move around curtains or see whether the lamp from the living room makes a better impression in your room. Shuffle the deck and see what pops out! Bring the outside in this spring. Adding plants to interior spaces can increase oxygen levels. Plants also release up 97% of the water they take in, so by placing several plants together, you can increase the humidity of a room, which helps to keep respiratory distress at bay. House plants also purify the air and even have a hand in reducing anxiety. If that's not a compelling argument for getting a few plants for your room, we don't know what is! Did you realise that the quality of your bed, mattress and bedding play a vital role in who well you sleep? If you haven’t invested in these items recently, it may be time to rethink your sleeping surface. If you’re not quite sure what kind of mattress or bed suits your needs, we’ve got excellent news - our Bed King branches now feature in-store Comfort Solutions Lab facilities that measure your unique pressure points to determine which of our comfort-graded sleeping surfaces is best for you. It’s a fool-proof way to choose the mattress that will leave you refreshed and ready to live life to the full this spring. These are just a few of the ways in which you can invigorate your bedroom decor this season. Keep an eye on the blog in coming weeks and months for more insider tips on turning your bedroom into a sleep sanctuary.